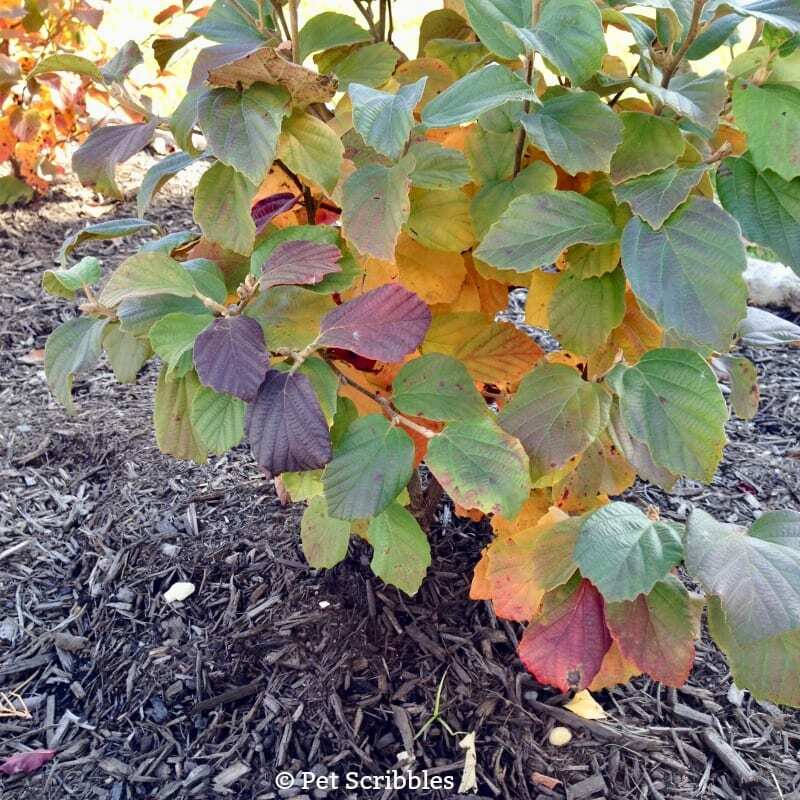 Fothergilla is one of my favorite shrubs for multi-season interest: bottlebrush flowers, blue-green leaves, bright Fall foliage, and pretty Winter interest. 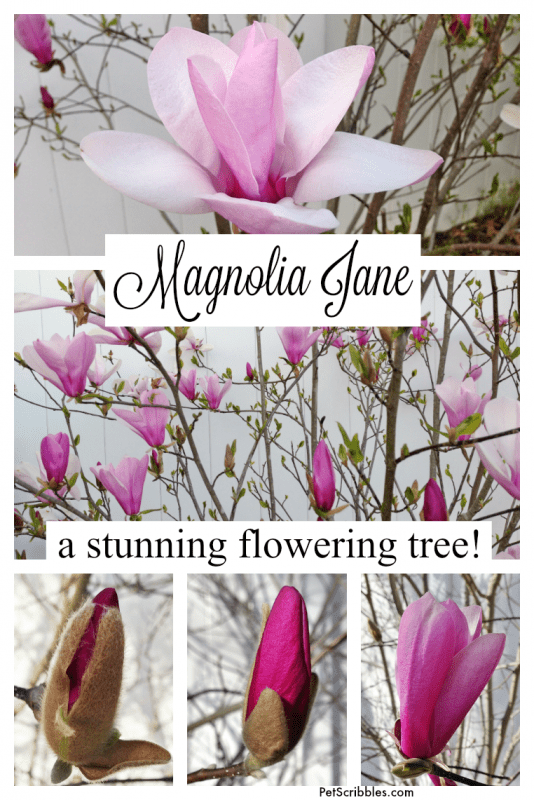 When you think of Spring-flowering shrubs, do you automatically think of Azaleas and Rhododendrons? 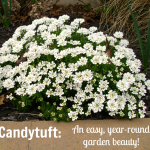 You’re not alone, as they are some of the best sellers at the garden centers and nurseries every year. 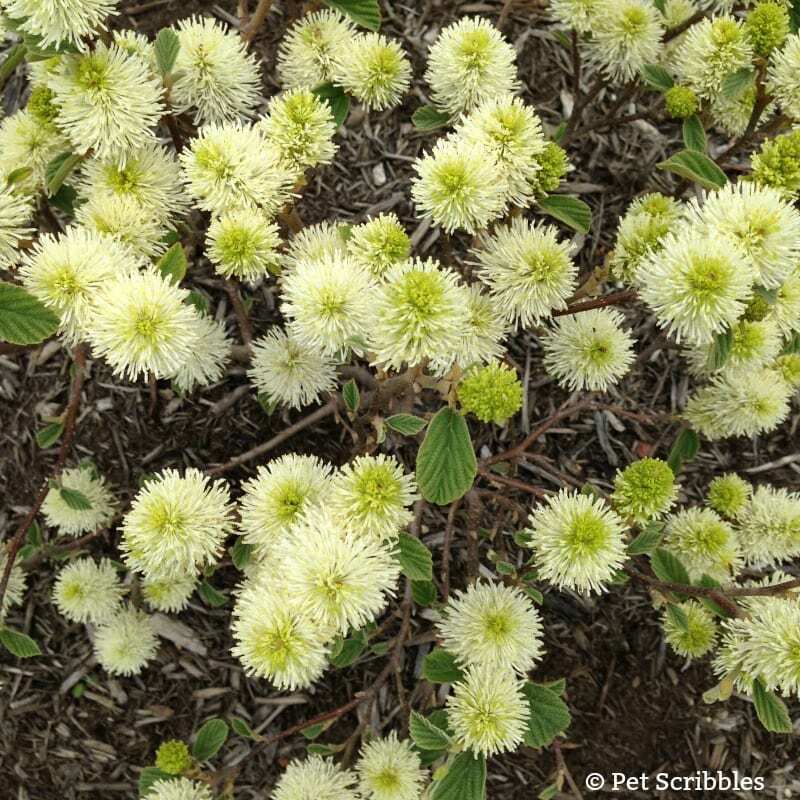 Today I want to introduce you to Fothergilla: one of my favorite shrubs not only for Spring flowers, but also for Summer and Fall color plus Winter interest. 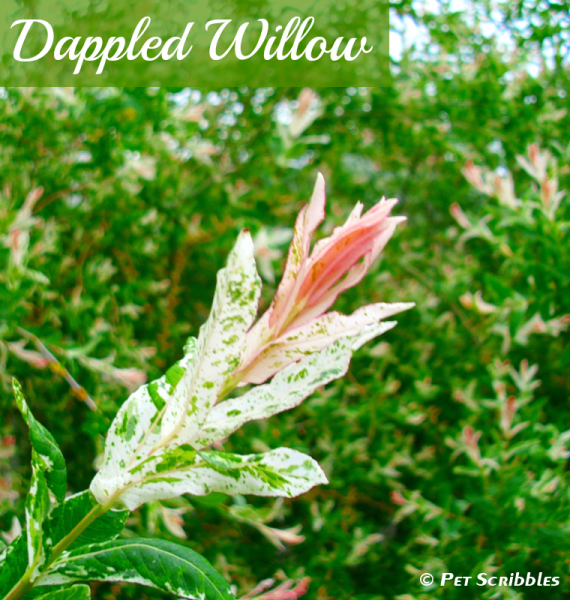 It’s an easy-care shrub that doesn’t need to be pruned. It’s pronounced like father-GILL-ah. 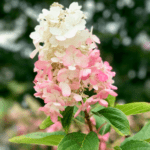 Think of the word “father” plus the word “gill” like what’s on a fish…and the “ah” can be for what you’ll say once you see this flowering shrub! 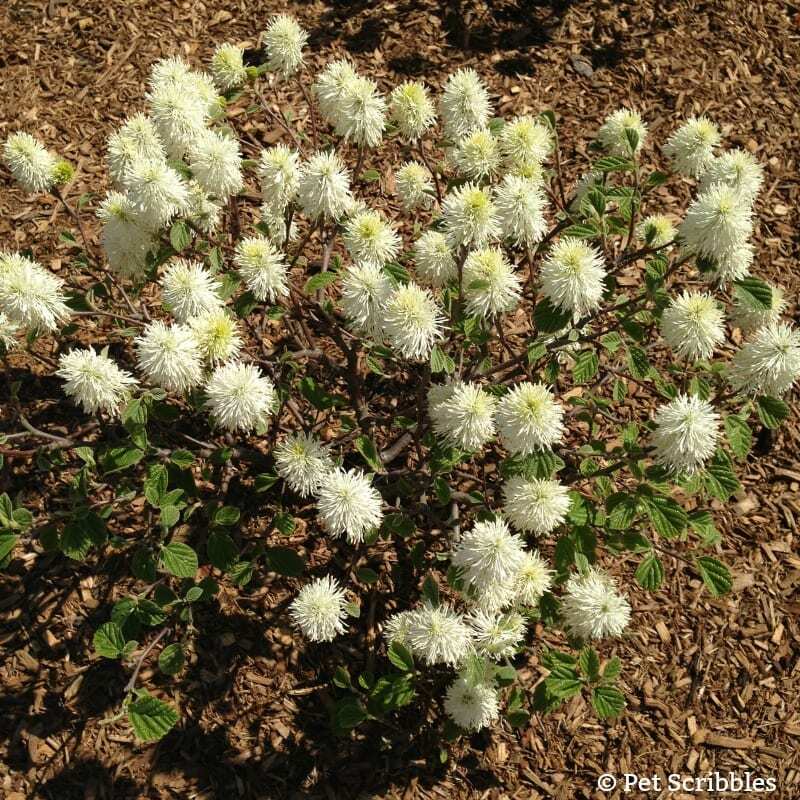 There are quite a few hybrids of Fothergilla, and sometimes they can be mixed up unintentionally because of their similar characteristics. 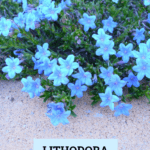 If you want to geek out and learn about the different varieties and why some of those hybrids can be a bit confusing, read this article by well-known botanist Rick Darke. 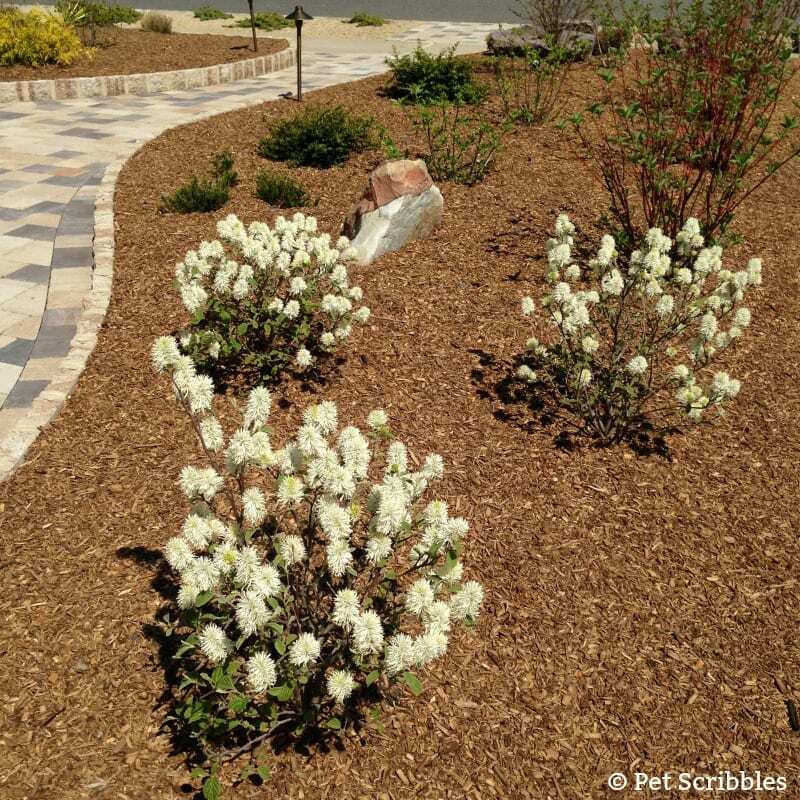 Fothergilla has all four seasons covered, as I’ll show you with my own pictures, further down in this article. 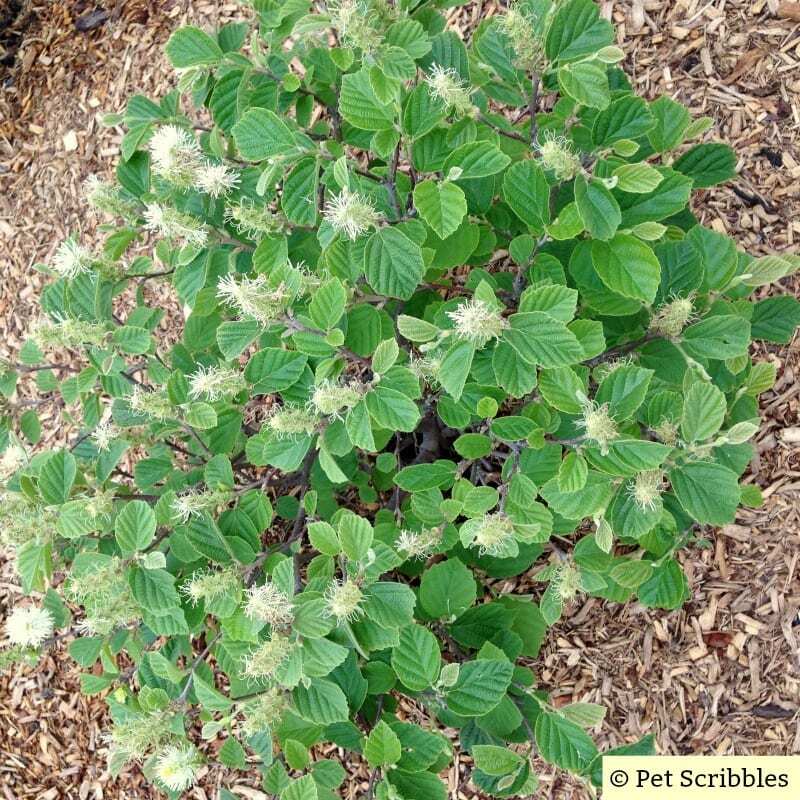 Mount Airy Fothergilla is the specific type of Fothergilla that we have. Supposedly deer resistant — but remember deer will eat anything if they’re hungry enough! 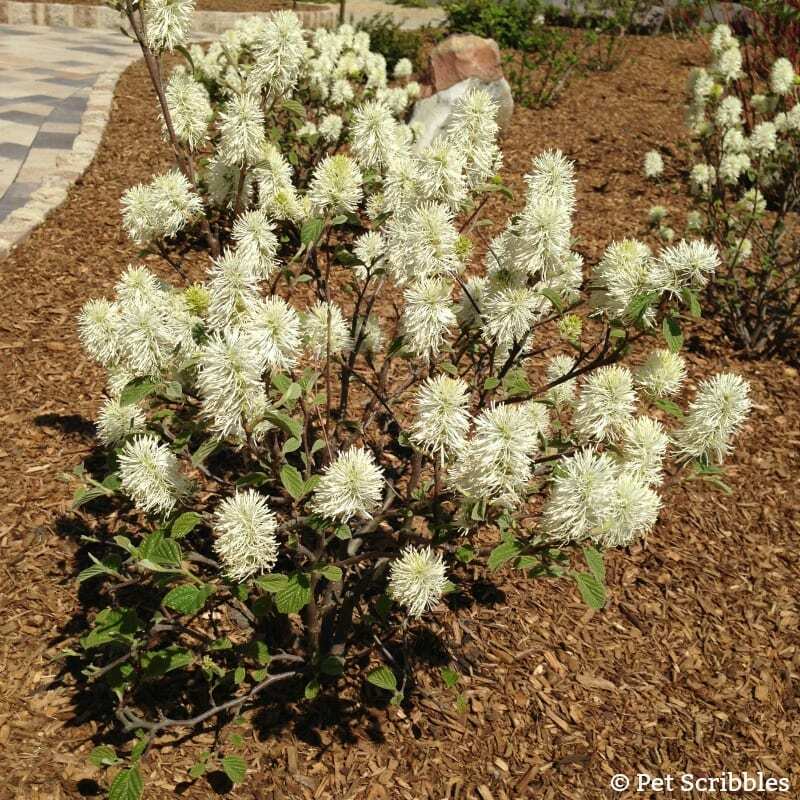 Fothergilla doesn’t need to be pruned. 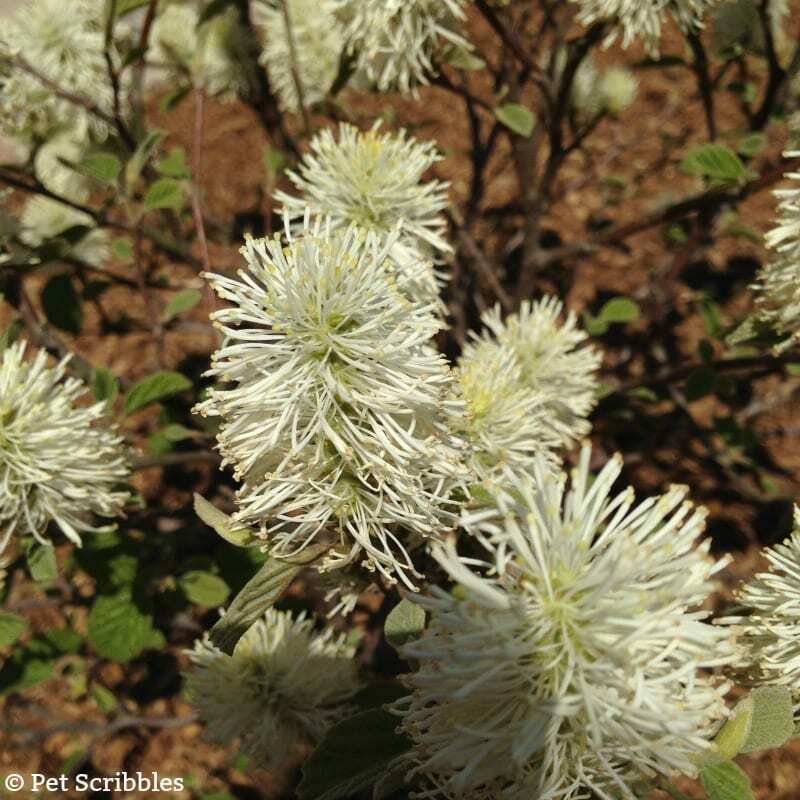 Fothergilla’s flowers bloom on the previous year’s growth — another good reason not to prune this plant. 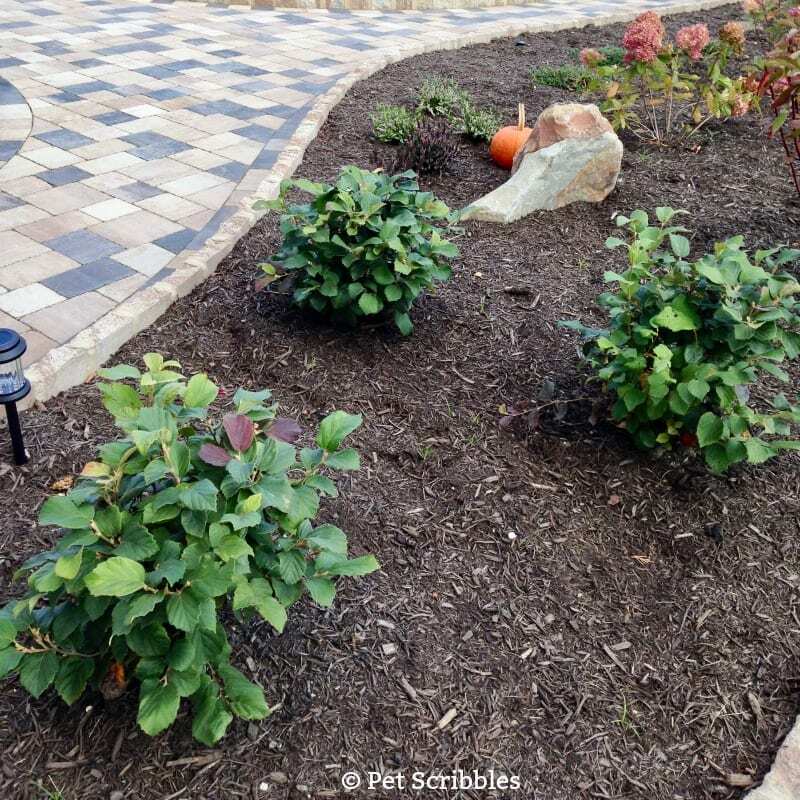 This is truly an easy care shrub! 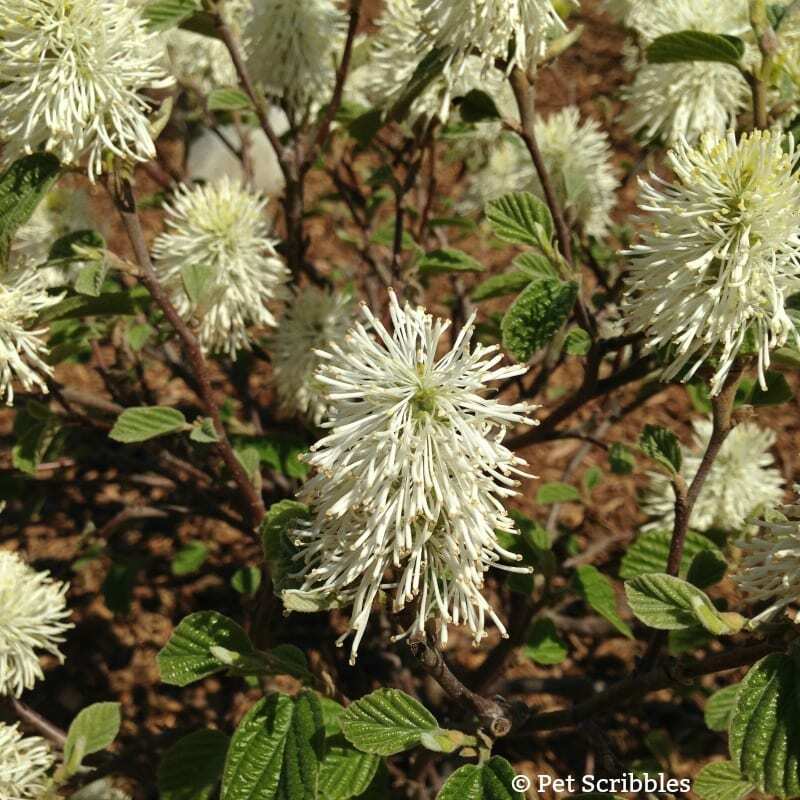 Fothergilla blooms in early to mid Spring. 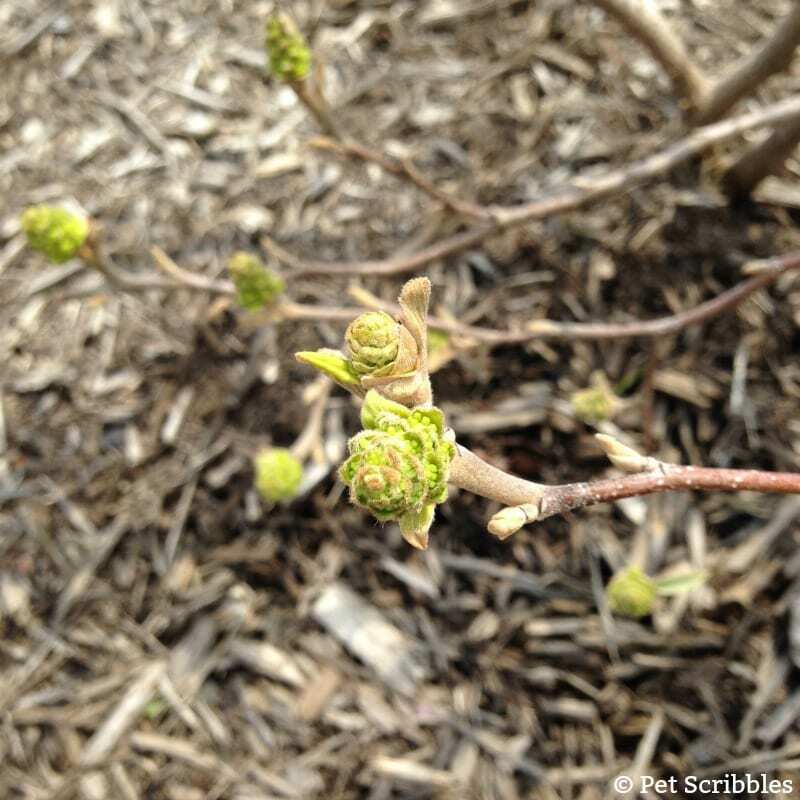 The flowers appear before the leaves begin to come out, and the blooms hang around for approximately 2 to 3 weeks. 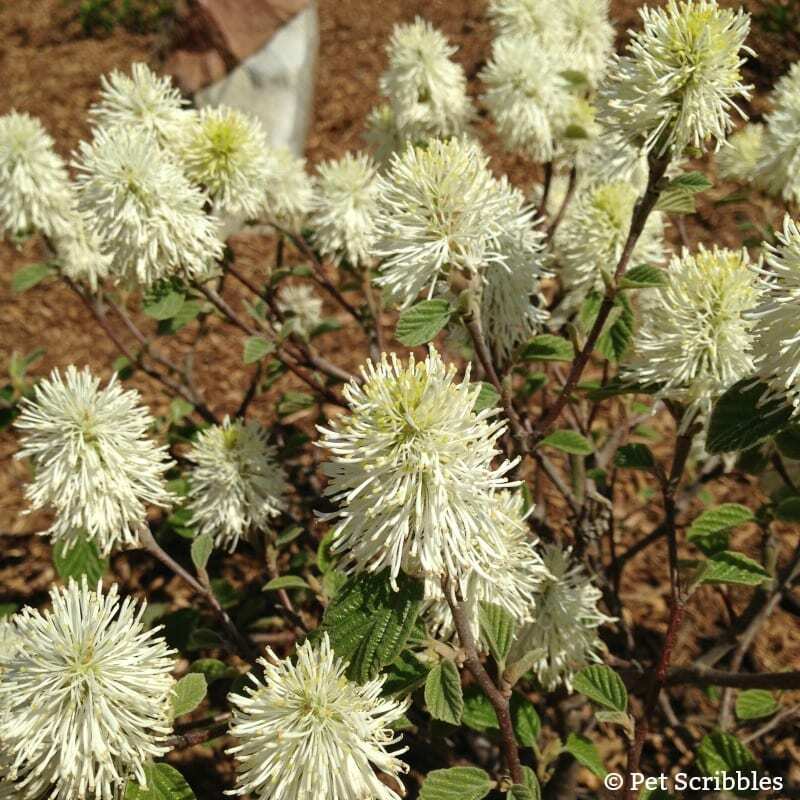 The flower show is spectacular with cream colored flowers approximately 1 to 2 inches long that resemble bottlebrushes. The flower scent is subtle yet intoxicating, like a mix of spices and honey. The scent isn’t overwhelming like when a woman puts on way too much perfume. It’s more like a light whiff of a scent you catch when you’re nearby, inviting you to come closer and gently inhale. 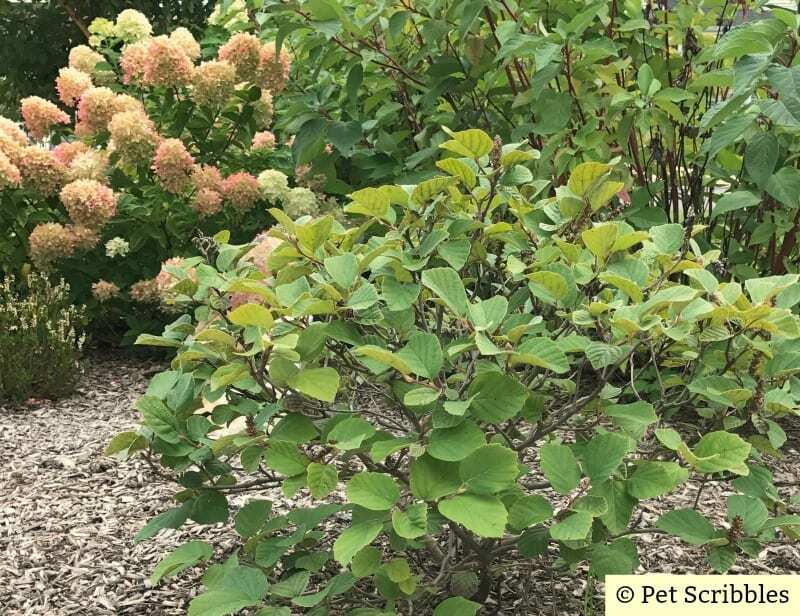 As the flowers fade, the leaves take over . . .
. . . and by early Summer, Fothergilla is covered in beautiful blue-green leaves — nice, full and lush. 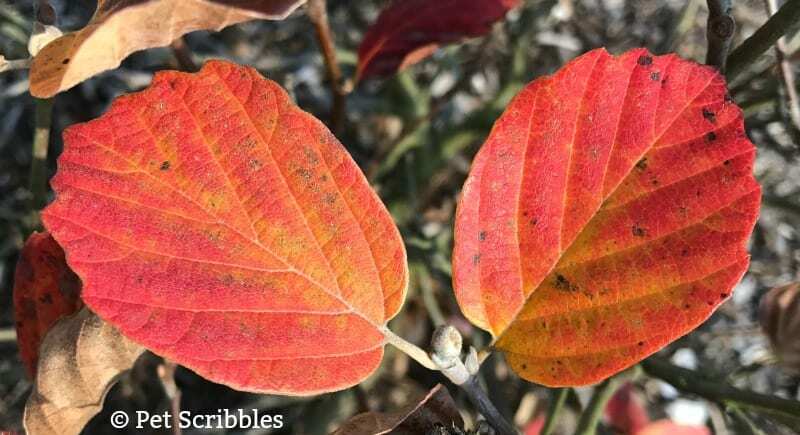 There are gardeners who plant Fothergilla mainly for the breathtaking and eye-catching Fall foliage display of reds, oranges, even some shades of yellow and purple all on the same leaf! And just a month later, each leaf looks like it was painted with the perfect shades of Fall! The Fall leaves will hang on late into the season. 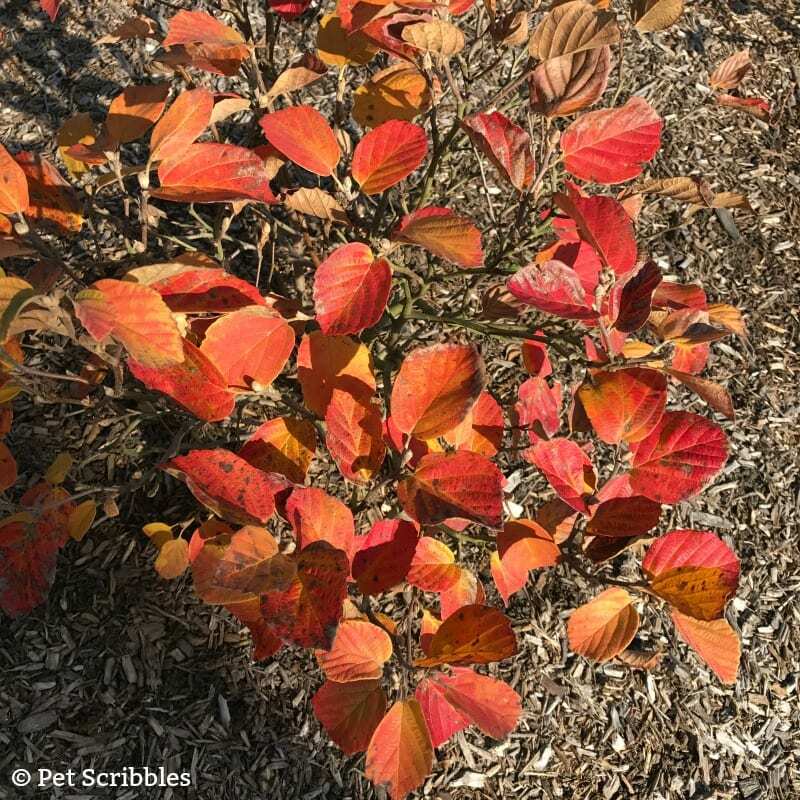 After many of the other leaves have fallen, you’ll still enjoy the Fall colors on your Fothergilla shrubs. 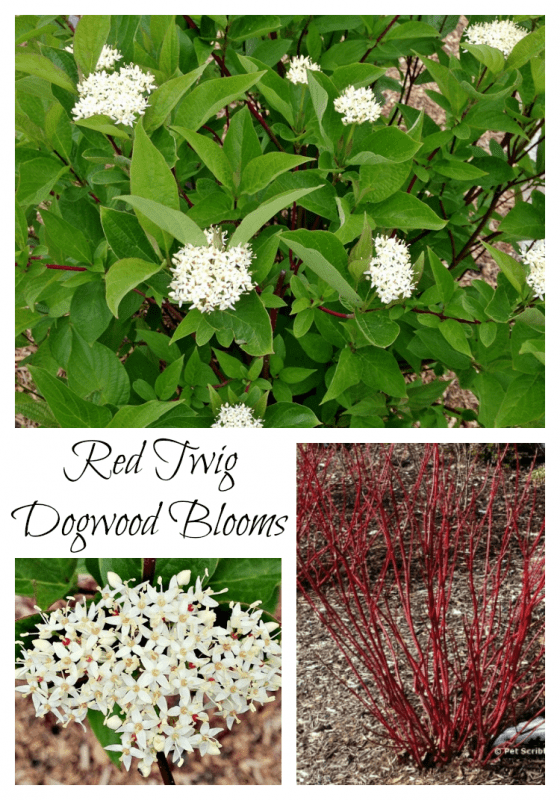 Because of the open, airy growing habit of Fothergilla, you get to see a beautifully shaped twiggy shrub during the Winter months. 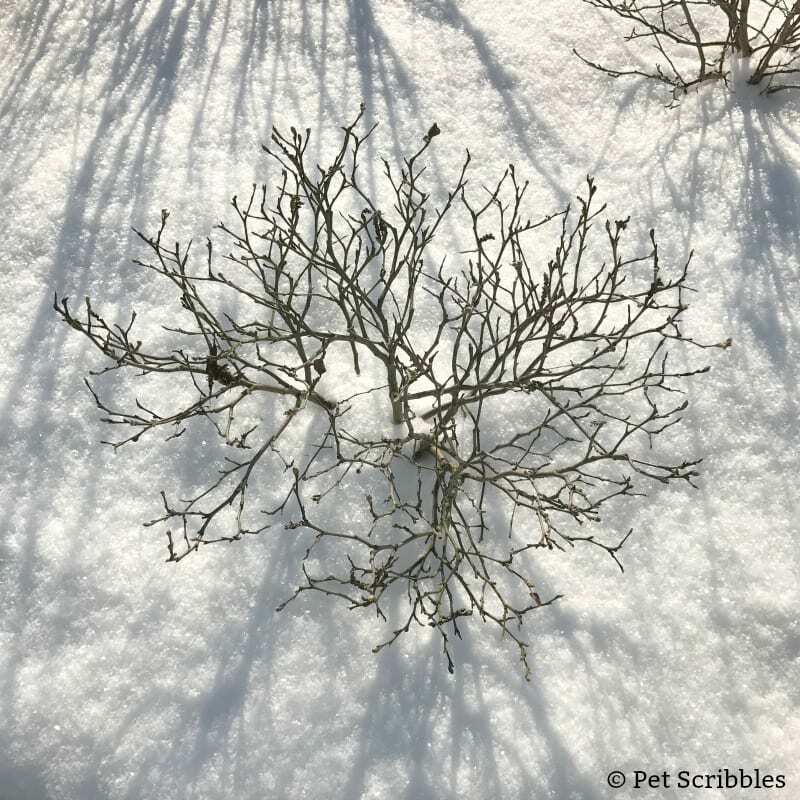 The look of the branches, especially against the snow, is so peaceful to me. 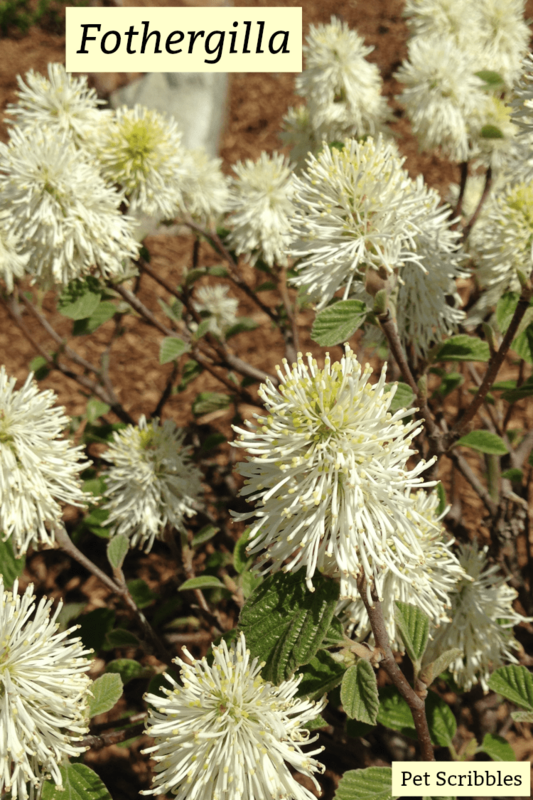 Now you know why I love Fothergilla! 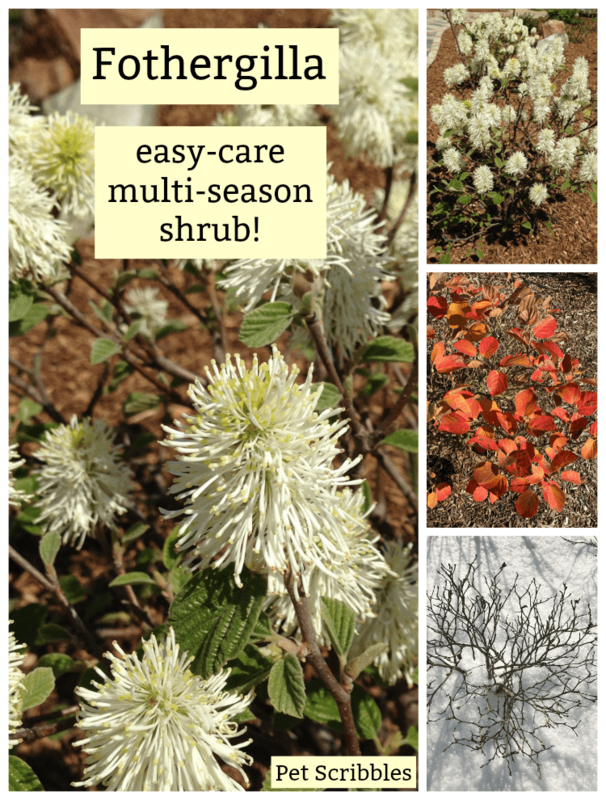 Multi-Season Shrubs are the best! 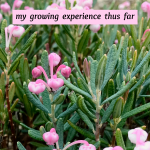 Interested in some of my other multi-season shrub favorites? 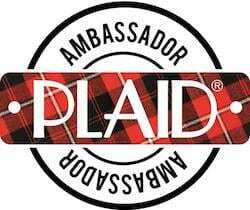 Then click below to read about . 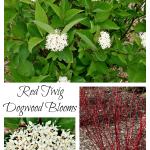 . .
Click on My Favorite Plants to see more of my top choices in shrubs and flowers! 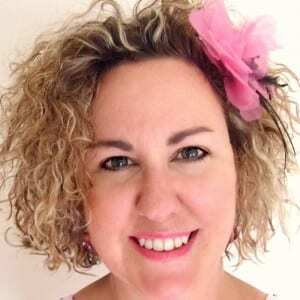 You’re welcome Lisa! 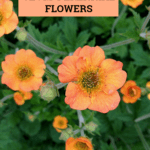 Stop back and let me know if you add these to your garden!